An animal autopsy of the 4-year-old polar bear named Knut that died suddenly at the Berlin Zoo on Saturday (March 19) showed distinct brain changes that may be the cause of death. The necropsy, or animal autopsy, was undertaken Monday (March 21) at the Leibniz Institute for Zoo and Wildlife Research. "The preliminary results show distinctive anomalies at the brain, which could be seen as the cause of the ice bear's sudden passing," according to a press statement from the zoo. "Other irregularities on the organs could not be found from the pathologists." "There was absolutely nothing to see. I was there one hour before he died, and I saw him resting there and he recognized me and he was absolutely normal in his behavior," said Heiner Klös, bear curator and biologist at the Berlin Zoo who has been responsible for Knut's care since the bear was born. Klös had to stay outside of Knut's enclosure, so there was a barrier between the two, but he recalls the last time they had physical contact when Knut was just 10 or 11 months old. Though the necropsy is not yet complete, Klös said the fact that they didn't find any abnormalities in the animal's kidneys, liver or heart suggest stress did not play a role in the death. "We are absolutely sure there was no stress and no heart attack, and no broken heart, if it's possible to find something like this," Klös told LiveScience. Though polar bears live alone in the wild, Klös said that in zoos where there's no real competition for food and space, the animals tend to play with one another — as long as you don't put two males together in an enclosure. To help Knut learn social skills, the zoo brought a young female, about 6 or 8 months old at the time, from the Munich Zoo to play with baby Knut. "Giovanna was a little bit stronger than Knut, and there was a fight between them, and Giovanna was the best one," Klös said during a telephone interview. Some days later, the two seemed to make up and were happily playing together, according to Klös. Then, when Knut was 3 1/2 years old, Klös and other zoo staff decided to house him with three females in a larger enclosure. They gradually introduced the bears, starting with the youngest female. For the first two or three weeks, Klös said it was tough for the little guy who was not used to defending food or space from three big, strong females. During the last few weeks of his life, Knut seemed strong and was marking and defending his area of rocks, showing "I'm the male polar bear," Klös said. Some visitors to the zoo may have thought Knut lived a sad life, but he didn't, Klös said. Like humans, polar bears are animals with individual personalities. "He was the shier type. So he played for three or four hours and then he [would] sit down in one corner of the cage and said, 'Well, please let me alone,'" Klös said. "A lot of humans visit Knut each day and these people think, 'Well, poor Knut,'" referring to the seemingly bored bear. "He had a fantastic experience and he was growing quickly and he showed absolutely normal behavior of a polar bear," Klös said. Even so, Knut's death at such a young age is rare, as male polar bears tend to live to their mid-30s in zoos and between 15 and 18 years in the wild, according to the San Diego Zoo. 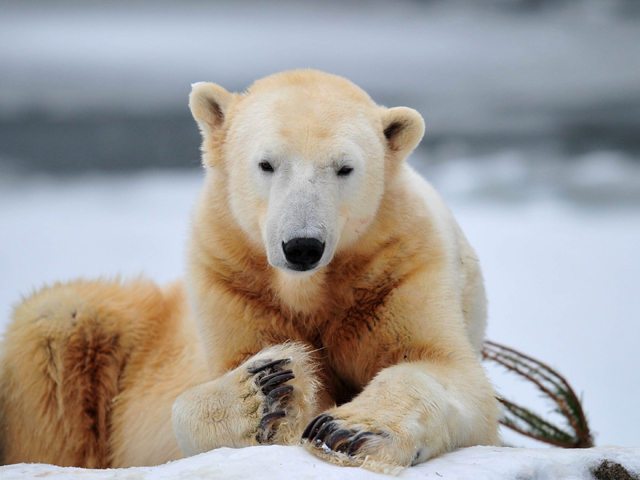 The oldest polar bear in captivity, Debby, was euthanized in November 2008 at age 42 at the Assiniboine Park Zoo in Winnipeg, Canada. She was losing weight and had multiple organ failure, giving no hope of recovery, Robert Wrigley, a curator at the zoo, said in a statement at the time. The second oldest polar bear in captivity in North America, Snowball, died at age 37 in October 2008 at the Cleveland Metroparks Zoo. About 20,000 to 25,000 polar bears are estimated to exist in the wild, according to the International Union for Conservation of Nature (IUCN). Globally, the polar bear is considered "vulnerable" by the IUCN, a designation assigned in 2005, based on the likelihood of a more than 30 percent decline in the total polar bear population within the next 35 to 50 years. The animal was listed as a threatened (defined as a species likely to become endangered in the foreseeable future) in 2008 under the Endangered Species Act due to shrinking sea ice — the animals' key habitat. Alaska, the one U.S. area where polar bears live, is embroiled in a battle with the federal government and conservation groups over this status, with one congressman introducing a bill to strip the bear of its threatened status. Zoo officials expect to have more results from Knut's necropsy by Friday.